Despite persistent rumors of its demise, hourly billing remains – by far – the most popular fee method for attorneys. And in some parts of the country – most notably Texas and New York – hourly rates are skyrocketing. Meanwhile, flat fees continue to be the norm in traffic, immigration and criminal cases. Those are some of the takeaways from the 2017 Legal Trends Report, which surveyed more than 1 million cases reported by 60,000 users of Clio software. Don’t mess with Texas when it comes to hourly rates. 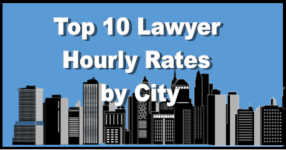 Law firms in the Longhorn State – mostly big firms that represent corporations – are hiking their rates as much as 10 percent, with dozens of firms smashing the $1,000 per hour threshold. It bears repeating that these results are from a national survey of Clio users. How do these findings correspond to your personal experience?